How does IBI Start work? The IBI Start version is based on the Scan – Plan – Go – Confirm method. Scan address labels with the camera, insert the addresses manually by typing or or through speech recognition. IBI scans labels with various kinds of printed fonts. IBI makes sure that the addresses are put in the most optimal route along multiple addresses. Choose for car or bicycle delivery. It is possible to add a comment line for each address. Start navigating by clicking on “navigate”. The optimal sequence for the route, that is provided by IBI, will be used by your navigation that is installed on your smartphone. Follow the route that is provided by your navigation. While navigating you can emove an address or add a new to the route. IBI will recalculate the optimal sequence for delivering during your route. Each visited address can be marked as “finished”. IBI will do a check on the right location and place a timestamp. You can add an comment to each address (for example: “not at home” or “package deliverd at the neighbours”). 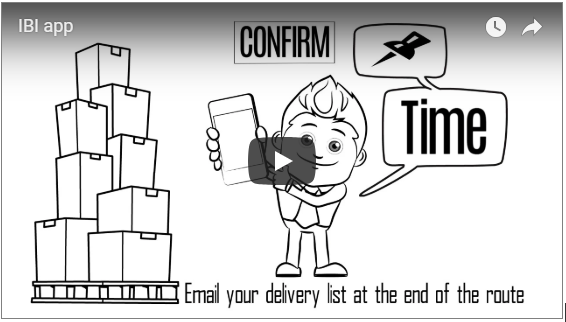 When you have finished your route, you can send a log of your delivery route by mail.